They say the Blue Mountains have some of the best scenery in Australia, certainly in New South Wales. We booked an apartment in Leura in the heart of the Blue Mountains, and headed off in our rental car with Helen who was visiting from the US. The sun shone as we drove out of Sydney and our spirits were high. As we drove up onto the plateau just past Penrith, we should have known. The clouds descended. The sun disappeared. By the time we hit Warrimoo we were at a standstill in Easter weekend traffic, in a torrential downpour. The rain didn’t stop for two days. Our apartment was cosy and spacious. We changed and braved the weather, strolling down the pretty old-fashioned high street looking for dining options and maybe a bar for later. Spookily there was not one bar in sight, just the Alexandra Hotel which didn’t look too bad until a peek in the window showed lots of lumberjack shirts and – wait – was that banjo-playing? Perhaps not. Down in the dizzying heights of downtown Katoomba, in the pouring rain, we did a circuit of the town and saw nothing. No amazing views, no decent restaurants, no bars. A second circuit offered us a bleak-looking place by the train station, but once inside they played excellent music and they were friendly enough. Dinner at the Greek place across the road was passable. But I was disappointed: where was the gourmet heaven I had been promised? Next morning we awoke with fresh eyes, hoping for better weather. Breakfast was in a great place called the Loaves and the Dishes. It became our weekend breakfast place. Down at Katoomba we stood and waited at the Scenic Viewpoint with hoards of others, hoping for a glimpse of the spectacular views we had been promised. At least the rain had stopped, but we were actually above the clouds. Then, mystically, tiny chinks started to appear in the armour. A tantalising moment of glory as the Three Sisters rock formation appeared then dematerialised; brief hints further away of the sheer drop down from the plateau to the lowlands. We should have known the weather was mercurial: the Blue Mountains tourism people have actually set up a giant screen cinema complex where they show movies of the Blue Mountains to the tourists. In the Blue Mountains. Only yards from where the movie was shot. Hmm. Do you think it might be misty and raining here much of the time??? Dejected, we headed for the Jenolan Caves, way down on the plain. The steep curving road down from the plateau hinted at the spectacular views we were missing, but we persevered. Now and again the clouds parted giving us more hints of the amazing countryside around us. At least it would not be raining under the ground. More than two hours later we arrived at a checkpoint in the middle of nowhere. A friendly man in oilskins told us that the save car parks were full and if we came back later or tomorrow they would let us in for free. A detour to the little town of Oberon proved fruitful: a bakery served fresh pies and good coffee while we waited a decent interval to try our luck again. Back at Jenolan, we were not disappointed. The cave system is huge, and we chose a late-afternoon guided tour of the Imperial Cave. We saw Lot’s Wife, a 2 metre stalagmite, tall and slim, and the Alabaster Column (creamy white calcite). The Crystal Cities looked like ancient fortifications in a far-off land. And as its name suggests, the Shawl Cave is filled with delightful shawl formations. The journey back was treacherous, it was late and we had reservations at Darley’s, the best restaurant in the region. Miraculously Orlando got us back with time to spare, so we threw on something posh, did our lippy (not Orlando obviously) headed to Lillianfel’s resort. Darley’s is in the heritage listed, original homestead of Frederick Darley, the sixth Chief Justice of NSW. We were seated in the enclosed verandah and settled in for the evening. Each course was divine. We drank wine by the glass (red, white and sparkling) from an encyclopaedic wine list. The candles flickered and the service was discreet but efficient. It felt a little old-style colonial, sitting on the verandah with overhead fans. Next morning we woke up and – amazingly – the sun had come out. The views from all sides were spectacular. We took photo after photo from the main viewpoint, then headed down to “Scenic World”, where you can take a cable car, a “skyway” (hmm still not sure what the difference was), an old funicular-style railway or a scenic walkway down onto the valley floor. We purchased a three-for-one thing which allowed us to try all three styles of travel. First up was the railway down to the valley floor. We sat in an old-fashioned funicular railway, and then we set off at what seemed like hair-raising speed to the tune of – wait for it – the Indiana Jones theme music! Hilarious! It was all over in about 30 seconds and I could have happily yomped back up to the top and gone down again. We spend a happy half hour or so wandering in the rain forest at the bottom, before heading back up to the plateau on the cable car. We were crammed in like sardines so couldn’t really see the amazing views stretching out before us, but it was fun and I did get a few random shots over people’s heads. Finally Orlando and I braved the “skyway” which featured a frosted glass floor which turns see-through when you are half-way across a gaping chasm, giving you 360 degree views. With my fear of being able to see downwards (I don’t want to say fear of heights, because it is only when I can see downwards without restriction that I get queasy) I was nervous enough. But the translucent bit of floor was small enough, and reinforced enough, that I felt quite safe in the end. Our evening was spent in the local Japanese restaurant, Hana, across the road from our apartment. The weather had turned nasty again as we braved horizontal rain for the 100-metre dash to this little upstairs den. It was crowded for a late Sunday evening but welcoming and warm. The food was very tasty, but I have decided that in general Japanese food is simply not spicy enough for my tastes. I shall stick to sushi from now on. Next morning Helen had to leave early by train to catch her flight back to the US. Orlando and I took advantage of some of the sunniest weather of the weekend to stroll part of the Prince Henry Cliff Walk east of the Three Sisters. We saw spectacular views of Mount Solitary in the distance, as well as Katoomba Falls and the Leura Cascades. It was ironic that we saw the very best of the Blue Mountains in the two or so hours before departing. The Labour Day weekend in Sydney was a relaxing affair, although I did walk my socks off (and have a huge blister to prove it). Australians are fond of looking down their noses on people who choose to settle in Victoria. They smugly announce to us newcomers that Melbourne is the only place in Australia where you actually need an overcoat. We have just spent a winter weekend in Sydney, and I am here to tell you that this assertion is wrong. Incorrect. Mistaken. False. Living anywhere where a winter weekend in Sydney is even possible is fabulous: we flew in on Friday night in time to catch a great late seafood supper in Chinatown, and spent the next 48 hours enjoying Sydney’s finest (of which more later). But hell, it was cold. Maximum 14C, easily down to 6-7C with wind chill. We brought overcoats, hats, gloves, scarves, and wore them all. The Vibe Hotel was possibly a booking I made about 15 years too late. A lovely hotel, with funky lilac and black walls, kooky white and spangly lanterns and mirrors above the bed, we were approximately a decade older than the mean resident age. But the location was excellent, somewhere in between Chinatown and the main shopping area. Sydney is very different to Melbourne. It is more sprawling, more littered, more hectic at night, more bustling by day. It feels like a city. We like it. On a Friday night, Golden Century Seafood Restaurant was a vast Chinese restaurant full of weekend tourists (us), Japanese tourists, local chefs just clocked off, after-work gangs celebrating whatever. The menu was lengthy; the fish tanks almost overflowed with lobster, crayfish, ocean trout, giant crabs, snapper, anything that swam. Waiters caught the fish in nets, weighted them on electronic scales and presented them to the table before whisking them off to the kitchens to be cooked. It is said that the best chefs in Sydney will be found here after hours, taking advantage of the late opening hours and the amazing food. Saturday morning was spent lying in after a post-supper bottle of champagne. Brunch was a full Irish breakfast in a well-known Irish hotel, the Mercantile, in the Rocks area near the harbour. The rain was beginning to settle in for a “whole wet day” as my mum would say, but we were prepared and didn’t care. The market stalls outside sold chilli chocolate bars and Ned Kelly replica armour (WHO? Who would buy one?) and the restaurants overlooking the Harbour Bridge slowly filled with tourists and local wedding functions. Even in the persistent drizzle the harbour is spectacular, the bridge and the Opera House eclipsing the grey skies above. We jumped on a local ferry to Manly, a seaside town on the ocean side of the harbour, and walked through the touristy shopping area to Manly Beach, a Pacific Ocean jewel less than half an hour from Sydney city centre. We strolled along, watching a surfing competition and counting the joggers, surfers, walkers and other sundry Sydney-siders intent on keeping their bodies fit throughout the winter months. We made the trip back as night fell – after all, it is almost mid-winter here in the southern hemisphere. We travelled west past the Sydney Harbour bays – Watson’s Bay, Chowder Bay, Rose Bay, Double Bay. The city skyscrapers were silhouetted against the darkening sky as we passed Bradley’s Head to the north. As we curved towards Fort Denison the view was breathtaking: The Sydney Opera House was lit up against the city skyline, with the unmistakable arch of the Sydney Harbour Bridge picked out by street lights and traffic. I stood outside in the wind and biting rain, taking in the view as the ferry brought us closer to one of the most beautiful city harbours in the world. 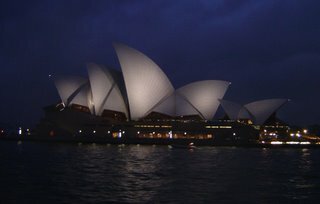 The Opera House changed shape, its sails shining white in the almost-full moon as we swung round into Circular Quay. 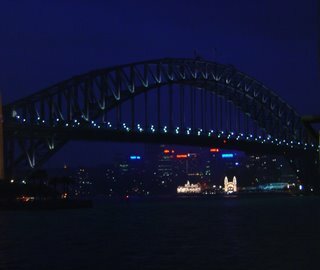 The bridge loomed above us, the bright lights of Luna Park sparkling in its shadow on the Kirribilli side. The cold took my breath away and the rain soaked my sensible boat and hat, but my weekend was complete: Sydney Harbour is unforgettable in any weather. Walking close to the Opera House after our ferry ride, we watched some Beautiful People congregating at Guillaume at Bennelong, one of the best restaurants in Australia – suitably positioned in the Opera House complex. One day, I promised Orlando, we will come for dinner there. A cocktail or two at the Opera Bar made a suitable end to our Harbour Cruise. Sunday was even colder, as we met some London friends for brunch at the Bathers’ Pavilion in Balmoral, on the northern coast of Sydney Harbour. Later, our hosts drove us to the North Head to witness a spectacular view of the city and the harbour entrance, as the winter winds whipped up an ocean swell which battered the cliffs on the Pacific side of the heads. It was a view we would never have managed to see ourselves, and despite the biting cold it was a fitting end to our winter weekend.